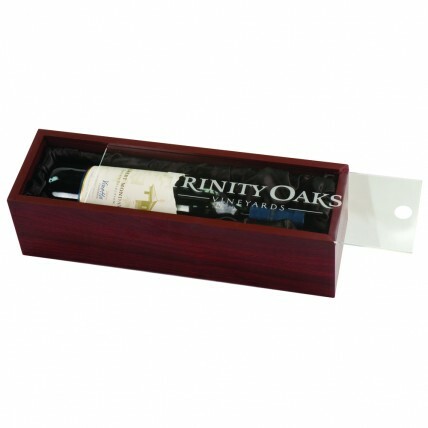 Looking for the perfect corporate gift? Our elegant Rosewood Wine Box with Acrylic Lid holds a beautiful bottle of wine with your customized logo and message engraved on the clear lid. Made of rosewood, the inside of the box is lined with black fabric. The clear acrylic cover includes up to 6 lines of your personalized engraving. Box measures 14 1/4" by 4 3/8" by 3 7/8"; wine not included. Production time for this product is 3 business day(s); expected pickup or shipping date is 04-26-2019.